The wandering Mr BadDragon has upped tent and moved again. This time to Belgium giants R.S.C. Anderlecht which represents a huge step up for him. The 34 year old is knocking on the big time and there are those who have doubts as to whether he has the ability to succeed at this level. The R.S.C. Anderlecht supporters reactions were mixed with the bulk supportive of the new manager’s appointment. There is a vocal minority who feel that he is untested at this level and that his appointment represents a risk to the club. The fans of his previous club are inscenced at his hasty departure and clearly feel that he has done them wrong. This departure has been made doubly worse by the fact that the Darmstadt Board had chosen him to lead the team forward, while he went out of his way to seek this new position. I am not in this game to make friends, I am in it to win trophies. Obviously it is easier to win trophies when you are playing for a top team, and Anderlecht was a side that appealed greatly. The fact that I have made a few people unhappy is regrettable but nothing I will lose sleep over! And the winner is… Anderlecht! Anderlecht represents a fantastic opportunity to establish myself as a top Manager. I don’t envision it being a long term stop, but if things go well I would like it to be a five year gig. This is my first big break. I know I have turned down BATE, but Anderlecht is in a different league. A club with a proud history who have fallen behind the money teams of Europe. This club has history, and is a dominant force in Belgium. It has been through a couple of lean seasons and looks right for another shot at the big time. I have a good sized transfer budget and there are a couple of young players I developed at Newcastle that may be good enough for the first team in a season or two. This club may just cure the wanderlust and perhaps I may be here for longer than a season or two. I have been given a three year deal and will look to make a go of maybe winning something in Europe. Who knows what the future will bring. Van Wingerden looks like being a top coach and adds a lot to the staff. Blackman is a relatively inexperienced coach who none the less looks good. Collington is a good skills coach and will fill out a hole in the setup. Finally Fernandez is a top fitness coach which will help with our players condition. I have made three signings in this transfer window. This will prompt me to have to move some players on for sure. This lad was a top prospect at Jomo Cosmos and has been on my radar for just this moment. “C.K.” is potentially the player of his generation in Australia and is another who I was determined to work with again. Finally “The Greek” has potential to be a star player, and it was always my attention to thrust him onto the world stage. I have never heard of this side before so have no idea of how tough they will be. Favourites to win the league is a nice place to be. Nothing like expectations being high, is there! We had a good preseason and looked good. We are struggling with tactical familiarity but that will come in time. We open with the Supercup followed closely by the Champions League play-off and the opening league fixture thrown in for good measure. 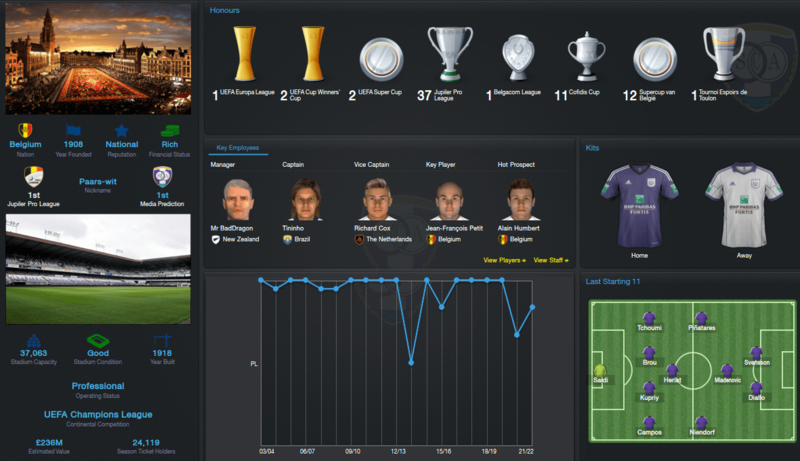 This entry was posted in 2022, A Path Less Travelled, Anderlecht, Season 2022/23. Bookmark the permalink.